My life has officially entered a new phase. As of Thursday, January 30, 2014, I am a permanent traveling dance instructor. There is too much to cover in an omnibus entry to give a full picture of my life. There has been a staggering amount happening since I was last on top of blog posts. Taking 30 minutes a day for Morning Pages has barely allowed me to keep a handle on it all, to keep processing all the change, to keep breathing. To make the task of picking up my blog less daunting, I will cover one portion of it: making the road my new home. Some backstory: my mom and dad still live in my childhood home in the suburbs of Portland. It's a wonderful house and was a great place to grow up. But it is very big, even more so when all the children have flown the coop. I moved back home in April 2013 and set it as my landing pad, the place to which I could return once a month to regenerate. It was the perfect base for a transient, which is unquestionably what I was: from April to January, I spent maybe a grand total of 6-8 weeks there. With free rent, a good work space, and a convenient excuse to see my parents on a quasi-regular basis and help them around the house, I was very happy with the arrangement. For some time, my parents have planned to sell the house some time on the horizon -- perhaps in 1-2 years. Meanwhile, I continued to book up my travel schedule. February would be Boston, then four continguous months spent in Europe. Life shifted near the beginning of January, at the start of the post-DFX teacher's retreat with a phone call from my mom: they planned to put the house on the market in March of this year and it could potentially sell within months after. 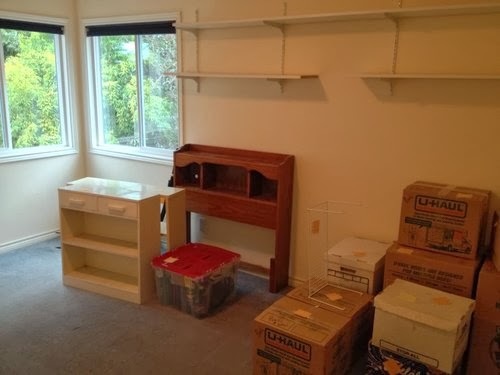 The home I grew up in was being sold, and I would need to get my belongings moved out in preparation for the move. Given that I was only going to be in Portland for a week before embarking on another five month journey of being on the road, I had a mere seven days to get everything ready. All the things. 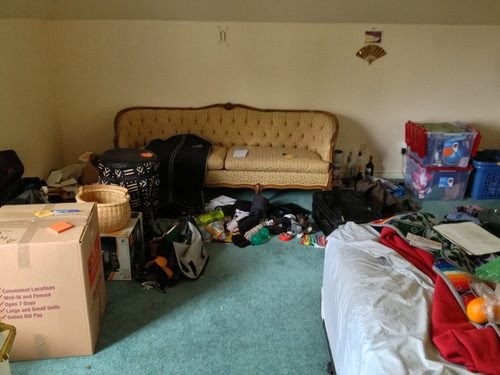 Get ready for the trip, decide what stuff to keep or toss, how to prepare myself to be permanently on the road or be able to get to my things within a month or two, somehow pack all of my stuff into boxes and get them to the storage locker, and say goodbye to the home that saw me grow into a man. Anticipating the raging mess that would be my life, I recruited the help of Ted, a dear friend whom I trust very deeply and know can get stuff done fast. Ted is a doer, and more than that he knows how to take care of others with impressive clarity. His schedule happened to be free, and he was more than happy to be flown up to Portland to help out a "chosen family" member in need. Packing was a whirlwind of activity. Ted was my professional get-stuff-done guy, but it meant I needed a steady stream of things for him to do. This kept me on task: I needed to be thinking constantly of tasks to delegate. It also meant I didn't have the luxury to linger on sentimental items, reliving experiences of my past. I needed to make snap judgments about whether it was worth keeping; and if not, how to keep some record of it if needed. Sometimes I resented the pressure, but other times I know it prevented me from descending into rabbit holes. 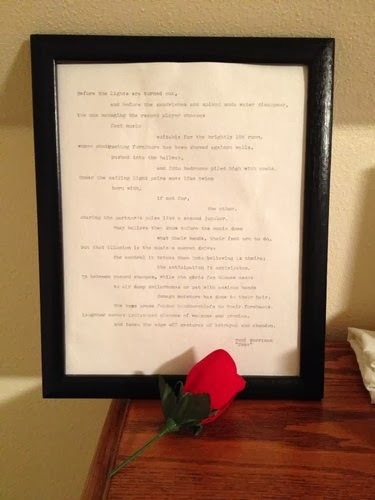 Here was a beautiful excerpt from a book framed by Lauren, or a turkey vulture's feather found on the road with her, or a little handwritten note that simultaneous made my heart cry and sing at the same time back when were first in a relationship. Even ones that were bizarrely emotional, such as an old fan used at my house in SE to keep cool in the summer of 2010, the halcyon summer days stretching our relationship forever in time. My house was riddled with them, little trapdoors into an alternate life where I have made very different decisions in those crucial moments of July 2012. Of course, the trapdoors ran back much further than Lauren, to past relationships by way of photo albums, drawings, or other trinkets. As a side note, those of you who know me probably raised an eyebrow at the idea of me making "snap judgments." I am the antithesis of snap judgments. True to my sign (Libra), I weigh any decision carefully and slowly, striving to account for all the angles and factors. You might imagine how this process of rapid-fire choices would tax me energetically. Fortunately, Ted was around to push me to a decision point at critical moments. While I may have spent an hour or two researching portable hard drives, Ted framed it in such a way that I could make a selection in ten minutes. Then, when I was utterly depleted, Ted would swoop in with a cup of jasmine green tea. I enjoy this effect Ted has on me. It drives me to be decisive, developing a side of me that is woefully lacking. When I'm around Ted, the choices of life somehow become cleaner, clearer. Negative outcomes from a decision are merely the next step in a neverending road of challenges to be overcome, rather than a callback to a poor choice made earlier on and one that should prompt feelings of guilt and regret. Also, I spend money faster around him than anyone else I know. Ted is a frugal individual, but he also has a clear notion of what is needed or important to improve his quality of life, and such things are worth a good deal of money. It's clear to me what can improve my quality of life as well, but I get hung up on the question of "is it worth it to me?" Am I worth that investment? Am I worth spending money on? Do I deserve to have a nice new suitcase that actually is fully functional, or should I continue limping along with a tattered one over a decade old that has a number of dramatic downsides? My stubbornness unquestionably works to my disadvantage here. Yet in his presence, such questions are brushed away with a whisk of the hand. Purchases are not made frivolously, of course; only items of real import are considered. Perhaps in a way, he holds a deep trust of his gut judgment about things he wants, he can trust its discernment enough to go with whatever is identified as being something desired. The example of purchasing a portable hard drive is perhaps not the perfect way to exemplify this situation. I very clearly needed one if I were to be able to survive on the road. Instead, I'll go with the last night in town, when we were in Portland. We made a spontaneous decision to visit the Icebreaker store, on account of it being right next to Cacao. (Side note: have you ever spent $150 at a chocolate store? I have. It's a weird feeling. Almost all of it is for eventual hosts on the road. It is important to me to be a good guest and offer a small gift of gratitude for their hospitality. And as both Ted and I have independently come to frame it: $150 is extremely cheap rent for many months on the road.) I entered the Icebreaker store intending to buy a couple pairs of underwear. I walked out with that… along with two shirts and two pairs of socks. While I certainly do have shirts and socks to last me, there is no denying the superiority of merino wool for travel. But I didn't agonize over the decision of whether it was worth buying -- I just knew it was worth it. (Well, I didn't agonize as much.) These were the things I needed, they would make life on the road way better, I would look far better in these clothes, so I would get them regardless of the price. Saying goodbye to my home was difficult. It's hard to know what to say or how to say it. Ted did a lot to aid me along the process, prompting me with the right questions. In the end, we went with a small group of good friends, celebrating with eats and drinks and general drunken revelry at my house. I did not do much reliving of old experiences, of the things I will miss. So I'll do a bit of that here. Saying goodbye to my room where I spent my middle school and high school years. Every morning I would wake up to behold tall evergreens just outside my window. I have no doubt that living here had a powerful influence on making me so passionate about and drawing such nourishment from nature. I'll miss Shelby, the family dog (a Shetland Sheepdog) from an earlier age, whom passed away when I was 18. She was buried in our backyard. I'll miss the sun room, where so much of my work got done. 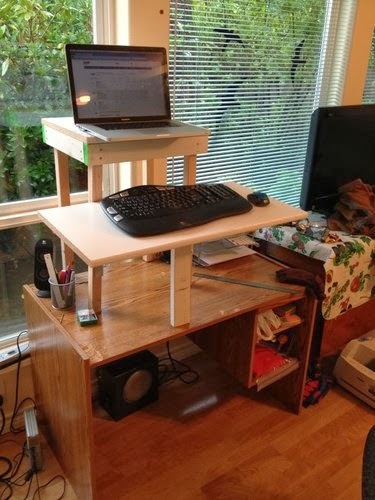 I had an excellent setup there with my standing desk constructed from scratch. Once upon a time, I would slave away late into the night working on my senior design project for college. More recently, I spent countless hours (actually, I CAN count them, since I track my work time now using Toggl, but we're being figurative here) watching lectures on programming and stretching my brain around new concepts, then writing endless emails to organizers to arrange dance events and tours of Europe. I could look out the full-length windows and marvel at the beautiful backyard, the tall trees, the diversity of colors, the (sometimes) blue sky. Such mini breaks offered such rejuvenation. It is important that I be within close contact with nature. I have never had a better work space. I will miss the unbelievable bounty of our backyard orchard. Apples, asian pears, and blueberries. 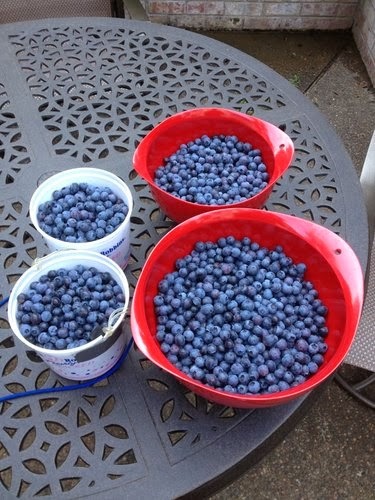 More blueberries than you could ever possible fathom consuming. So many that you'd eat them like chips -- by the handful. Giving them as gifts to friends, sharing them with neighbors. Sharing an experience of berry picking with someone was a decidedly intimate experience. When you're up there for an hour (or more) at a time, not facing someone, just the two of you, mildly occupied with a physical activity, enjoying the warm Portland summer, you can dig in pretty deep. Romantic relationships were started in that orchard of berries. Friendships were granted a new depth of profound vulnerability. In that space, you could say anything, feel anything. It was safe. I'll miss the expansive and enveloping back yard. With the hill and abundance of trees, it is easy to feel nestled in a little grove. I recall the cubby hideout in my old room. It was a 3'x3' cutout in the wall of my closet, revealing a small hideway about 4'x3'. Once upon a time in middle school, I had missed the bus to school YET AGAIN. It was because I was caught up playing Final Fantasy VII in the morning and lost track of time. Athey Creek (my school) was a 30 minute drive away, so walking was out of the question. In previous instances, I took a taxi arranged by my mom. But I was so overcome with embarrassment that I decided to try covering my tracks. I never went to school. 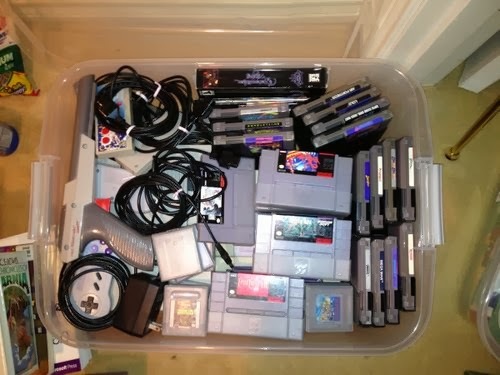 When my mom came home early that day, I hide in that hideaway and read a book and played Game Boy. I would have gotten away with it, too, except that the school contacted my parents a couple days later, stating that I had not shown up to class that day. Busted. I'll miss seeing all those LEGOs decorating the walls of my room. I was a huge LEGOs fan. One time, I built a whole city along the hallway leading to my room. There was a supply depot, storage facility, airport, repair bay, junk yard, police station, and lots of amazing robots and flying vehicles to police the city and mine ore and defend against invaders. It lasted for about a week, until my parents revoked the zoning permits, on account of the city making it exceedingly difficult to walk down the hallway. I am saying goodbye to a childhood of videogames. 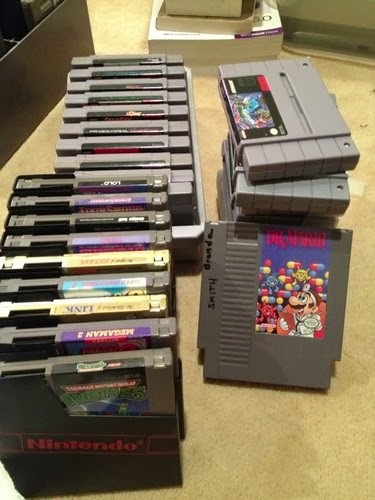 I have packed away most of my NES and SNES games -- no way I could part with those -- even though I will probably not be playing them any time soon. 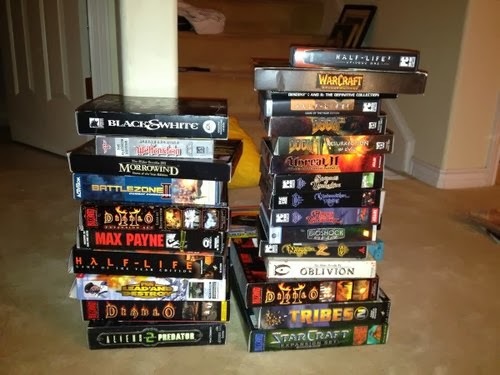 I also rifled through my collection of computer games, which were highlights of my younger years and in high school. Doom, Descent, Syndicate, and newer ones like Command & Conquer, Half-Life, Doom 3, Counter-Strike, No One Lives Forever, Warcraft II & III, Diablo I & II, Black & White, Starcraft, Starcraft: Brood Wars, and of course the biggest time sink of all: all three of the Neverwinter Nights series (original, Shadows of the Undrentide, and Hoardes of the Underdark). NWN was the recipient of truly countless hours of my childhood. So much time spent online, roleplaying with people around the country and world. Online roleplaying was where I developed much of my love for acting, for storytelling. I also was able to broaden my imagination. I learned how to develop relationships and alliances through words. I genuinely believe part of what enabled me to be mature for my age was exposure to online roleplaying, of its focus on connection and interaction and play, of having time to develop your thoughts carefully and craft your words meaningfully. I am actually grateful for its presence in my life, even if it meant missing out on other experiences, because I still carry with me valuable lessons from that time. It's coming in handy again as I once again return to maintaining many relationships remotely / virtually, where your primary avenue to bond is through words. I recall my secondary room in the house. I would stay there when I came to visit from graduate school. (My original room had been converted into a storage room by that point.) It is the room into which I moved when I came crashing and burning from the smoldering wreckage of a failed attempt at life in NYC. My parents were there for me when I hit rock bottom. They let me stay there, move back in, gave me space to nurse my wounds and rediscover my verve and nerve. This room witnessed a man step in shattered and lost, and step out driven and grateful for life. Instead of hashing through these memories and so many others, the focus was placed on what comes next. How will my life be moving forward. Hence the group of close friends, gathering for drink and merriment. So much silliness ensued. There was much modeling of underwear, there was laughter, there was wacky dancing, there was much admiring of me in different outfits. One of my favorites involved a makeshift bandoleer. Not exactly one appropriate for teaching a dance class, but that's okay. 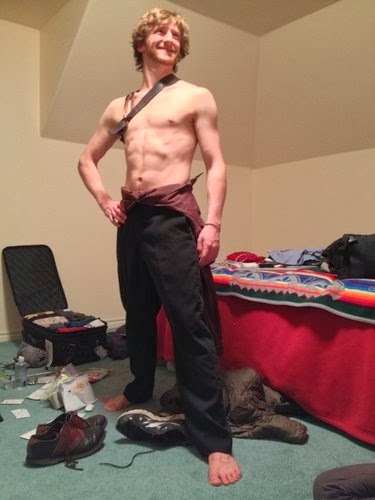 The praise and admiration of my friends for my physique and spirit was precisely the kind of boost I needed to embark from a place of deep safety. Sometimes I forget how much I am moved by words of affirmation. By the end of the night, I was overcome with emotion. I had been so strongly reminded that I always have family: both blood family and chosen family. And that family will take care of me. My family respects and admires what I do and think and share. I may be homeless, I may be following a winding trajectory that very few others follow, but I am walking the path with integrity and I am doing a good job. I have lost a home that once felt permanent, a place to which I could always return no matter what. I have discovered that now homes exist spread throughout the world. I have the power to make such places feel safe and nurturing; all I need to do is be vulnerable, have the courage to reveal my imperfect self, and ask for the support of others. My home is my suitcase. What I need to contribute to and exist in the world, I carry within my chest or upon my back. I do not know where this road will lead me. I do not know how long it will last. I do know my journey will never be short on amazing company, the likes of which leave me wondering what I ever did to deserve the love of such beautiful people.